Perched above Pamela’s in Shadyside is a Peruvian store and restaurant going by the name of La Feria. It claims to be a sister restaurant to Pamela’s, which is strange considering the utter lack of Peruvian in Pamela’s menu, but there it is. And despite the lack of guinea pig and alpaca on the menu, I was eager to see how Pittsburgh would do Peru. Apparently Pittsburgh is home to one of the most popular spots on Yelp, like, ever. And while I found this out after journeying to the Strip District for some food, I can report that Yelp got this one right. The place is called Gaucho Parrilla Argentina and is an Argentinean steak, sandwich and anything else awesome restaurant without enough seats to handle my immediate family. While the place is all about their wood-fired grill, I actually pursued a different route on my first visit. Not knowing what I was in for, and being led to believe that I was heading out for a night of cheap cocktails and free food, I headed to Picca Cantina on Pico. Unfortunately, although I had been promised free food, a miscommunication led to food being regularly priced. But this regularly-priced food still looked quite good and the bartender gave us our first round of drinks for free to apologize for the confusion. 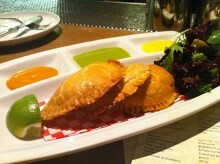 The menu consisted of some great-looking Peruvian dishes with a bit of a tapas flair. I ordered myself a Cusquena beer and then we got busy with ordering food. 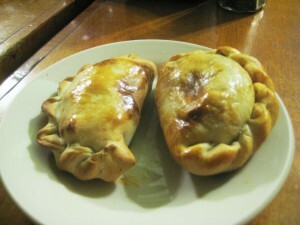 By suggestion, I went off to the Grand Casino Bakery in Culver City in search of some good Argentinian food. I’m not entirely sure how they wound up with a name like that, which really doesn’t convey images of South American food, but somehow it works in this crazy town of LA. 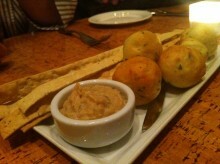 Going to Bossa Nova is not the easiest dining experience around. This is nothing of their fault. I’ve never had any trouble getting a table or getting good service. Rather, it is the difficulty in deciding what to get from their textbook of a menu. The possibilities are almost limitless, ranging from sandwiches to pizza to pasta to steak. And somehow this is a Brazilian restaurant. With so many options, they manage to have a good amount of unvegan food. 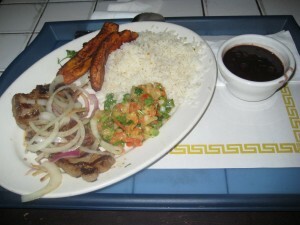 Since I was at a Brazilian restaurant, I decided to get the Picanha Steak. It is a special Brazilian cut that has never let me down. 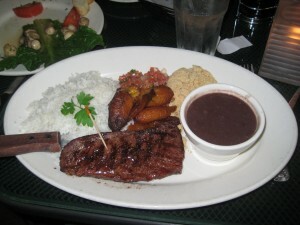 It comes from the “Hot from Bossa Nova Grill” section, meaning I also get plantains, rice, beans, yucca flour and salsa. Not bad for $15.99. When my plate came, it looked almost perfect. Cafe Brasil is one of those restaurants that has always been elusive to me. I have driven or walked past it in Palms countless times, but never gotten up the courage to step inside. I finally took the plunge and stepped into the Cafe. At first I was confused by the place. There are three different seating areas. One is inside, one is semi-outside, and one is for real outside. I found a table in the semi-outside, but then realized I had to order at a counter. Ordering at a counter always puts a lot of pressure on the consumer, especially if they don’t know what they are going to order. Under this deep pressure, I went with every unvegan’s default choice, steak.